Saturday, June 15, 6-8 p.m.
Saturday, July 20, 6-8 p.m.
Saturday, Aug. 17, 6-8 p.m.
Saturday, Oct. 12, 6-8 p.m.
Friday, Nov. 22, 5-7 p.m.
Saturday, Nov. 23, 3:45-5:45 p.m. The Gettysburg Cyclorama, painted in the 1880s by French artist Paul Phillippoteaux along with a whole team of artists, is a massive piece that runs 42 feet high and 377 feet long, making this Cyclorama one of the largest, free-standing paintings in North America. It is a rendition of the famous "Pickett's Charge" on the third day of the Battle of Gettysburg. This massive work of art is suspended in-the-round from the ceiling with a viewing platform. A contemporary art version of the Gettysburg Cyclorama has been on display at the Hirshhorn Gallery of the Smithsonian on the Mall in Washington, D.C.
Join Sue Boardman, Licensed Battlefield Guide and co-author of The Battle of Gettysburg Cyclorama, A History and Guide, for a behind-the-scenes program about the Cyclorama. The presentation covers the creation of this piece of art, the rich symbolism found in the painting, a discussion of the massive conservation effort, extensive time on the viewing platform in full light and a walk under the diorama itself to see how this work of art comes to life. 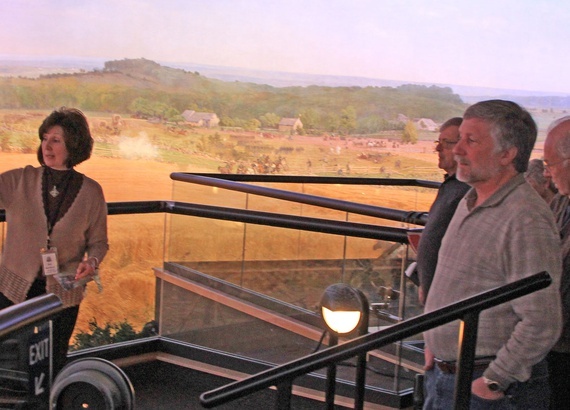 Sue Boardman on the Historic Gettysburg Cyclorama. 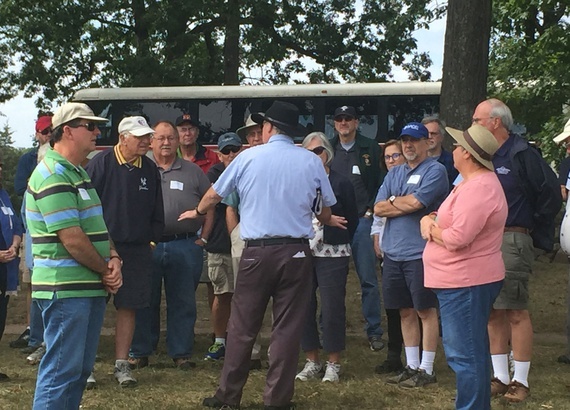 The Gettysburg Foundation periodically offers half- and full-day programs that go in-depth on various subjects, featuring Licensed Battlefield Guides and other presenters. For more information, view our calendar.